Knowing how large or small an object is is very important to not only scientist, but everyone. These activities help you understand the how big or little things are and how to describe their size correctly. The following activities will help you discover more about size. We hope you enjoy these activities and do them together as a family. Archaeologists and paleontologists search for objects in the ground, including fossils and remnants from past civilizations. They keep logs of all of the objects that they find, but cannot draw each object at its true size. Therefore, they must scale their drawings according to the size of the dig site. 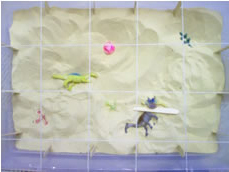 In this activity, you will become an archaeologist and dig for artifacts. All pictures are comprised of pixels. These pixels are small dots that are close together on the paper and sometimes trick our eyes so that we think the color is continuous. In this activity, you will investigate pictures from different sources and compare the pixels. Scale drawings are useful for many things. Many times, small drawings are done before the larger model is built in order to make sure that everything will go as planned. Imagine buying a sofa and bringing it home only to find that it won't fit in the room! There are many ways available to enlarge pictures that we like. Computers are able to digitally enlarge pictures for us. This is one way that we can get many different sizes of pictures from our cameras. Another way to make pictures bigger is to do so by hand. In this activity, you will enlarge a photo by hand. The metric system is a base ten system. This means that all of their measurements are based on being 1/10 th of the next larger thing. To see how much of a difference this is, you will divide a unit of measurement into ten equal pieces and continue doing so until you have a range of scaled measurements.